Did you want to participate in Droom MTV Dropout but could not be a part of it for some reason? Do you believe that you have the ability to come up with great B-Plans and better ideas than the Droom MTV Dropout contestants? Do not worry as you still have got a chance to win mentorship by unicorn founder Sandeep Aggarwal, several exciting prizes and a lot more. 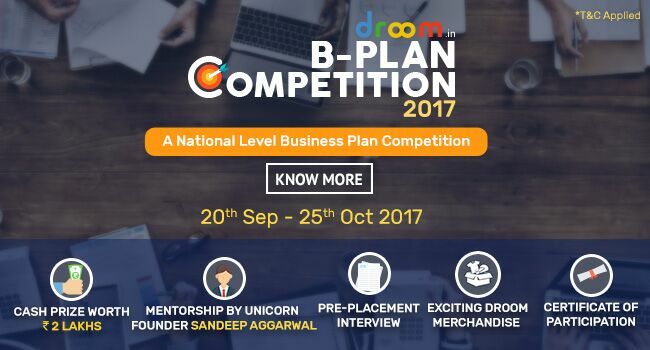 Droom, India’s first and only online marketplace for buying and selling new and used automobiles, is going to organise Droom B-Plan Competition 2017. This is a platform through which Droom will provide an opportunity to the individuals with intelligent acumen to design a strategic solution for real life problems faced by Droom and the online automobile marketplace industry. Being the largest auto portal in India, Droom has more than 65% of market share in online automobile transactions. Droom B-Plan Competition 2017 got launched on 15th September, 2017. The registrations are opened from 20th September, 2017 while the last date for entry will be 25th October, 2017. The competition brief can be downloaded from the page itself. All the business plans need to be submitted in the form of a presentation. The performances will be evaluated on the basis of submitted presentations and the comprehensive feedback by the jury or Sandeep. The final results will be declared on 1st November, 2017. The final winner of Droom B-Plan Competition 2017 will receive a cash prize of Rs 1 Lakh + 2-hour mentorship session with Sandeep Aggarwal. The 1st runner-up will get a cash prize of Rs 50,000 while the 2nd runner-up will receive a cash prize of Rs 25,000. Apart from this, all the participants will receive an e-certificate for participation and the first 500 entries will win exclusive Droom merchandise. Moreover, the three winners will get an opportunity to appear for a Pre-Placement Interview to work at Droom. So, what are you waiting for? Go and get the opportunity before it goes away. If you are an engineer, an MBA student, or a budding entrepreneur, this is the best platform for you to showcase your skills in front of the market leaders. Droom B-Plan Competition 2017 will drive you forward in your careers so that you can achieve your professional goals. Furthermore, business planning improves your chances for success and it helps you gain clarity, focus and confidence.